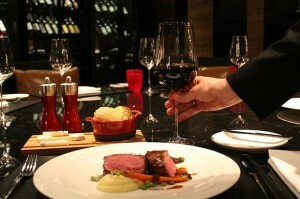 At District Grill Room and Bar, the emphasis is on premium cut steak but many other details make it an easy standout. Bangkok may be relatively light-years away from New York (NY) with regards to being a city of steakhouses, but who says we can’t enjoy steaks NY-style in Krungthep? In fact, there’s a new restaurant in town that makes no bones about being a truly contemporary NY-style steakhouse – The District Grill Room and Bar of Bangkok Marriott Hotel Sukhumvit. The District was actually named after the historical meatpacking district in Manhattan, now the heart of NY’s hip restaurant scene. The modern NY influence is evident, not only in the fine steaks it serves — “We use only the premium cut,” says Chef Itthi Nitayaporn – but also in the menu and the décor. Vintage photos adorn the dark walls and lightning is minimal, with simple bulbs on a rack next to every table. Our table, chairs, and even the leathery table covers are in classy black. A combination of design elements creates a subtle mood, and inspires easy conversation, until the eyes are drawn, frequently, to the most visible highlights: the open kitchen and live fire. Both are absolutely engrossing. Many other details make the place a real standout; foremost of course is the food. From starters to desserts, the menu makes it obvious that this restaurant wants nothing less than to be labeled a cut above the rest. Our meal proves that without doubt. We started with a classic: Caesar Salad with Romaine lettuce, bacon, and Parmigiano reggiano (Bt400++). The salad has a creative look, as the whole bush of lettuce arrived on a large plate, coated with an innovative foamy dressing, and subtly sprinkled with cheese. A sheet of crisp bacon was sitting on top like a fleshy statue. We wanted to try some of the fish, too, and our choice didn’t surprise the chef a bit: it is one of the most popular on the menu: Hot District Heights, with grilled lobster, prawns, scallops, fish, chips and lemon (Bt2,800++). Set beautifully, the seafood was cooked just right, albeit perhaps in not quite enough portion to fill up two guests. 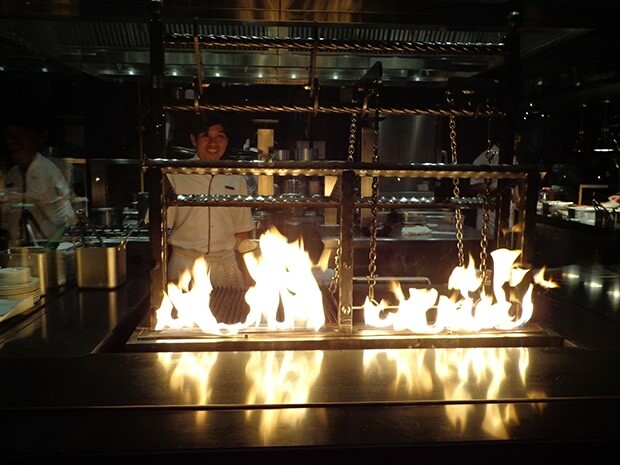 But emphasis on this restaurant is on steaks and we were eager to try Chef Nitayaporn’s cooking philosophy, which he says is, “to get the best out of my product.” This happens to be the prestigious Diamantina Angus beef from Queensland, Australia, grain-fed for 240 days. The breed, pasture, and diet assure tender juiciness of this meat. I chose tenderloin, 180g (Bt1,350++), juicy medium, and altogether to-be-desired-for. On the sides, we ordered gratin dauphinois and sautéed mixed mushrooms (Bt220++ each). Creamy and tasty, and neither one too mushy. We paired the meat with Cabernet-Shiraz Lindeman’s, Premier Selection (Bt380/glass and Bt1,500/bottle), an Australian wine that is medium bodied with soft tannins and juicy acidic hint of pepper; perfect with the tender meat, putting a perfect finish to our luxurious dinner. The restaurant stands out because of staff service too. Polite and friendly, they are certainly an important ingredient in ensuring that every guest enjoys a pleasurable meal. Then there’s the location. The five-star hotel is situated between the two current toast of the Bangkok foodies’ crowd – Thonglor and Ekkamai – a location that again, really stands out. There are no upscale steakhouses at 1km radius in the area near the hotel, says Gerrith Graef, Bangkok Marriott Hotel Sukhumvit GM. And despite its premier location and high quality product, The District is not at all that pricey. “In terms of value for the money, we are very competitive,” says Graef. And that’s just another reason why The District has been gaining such a large clientele of locals already.